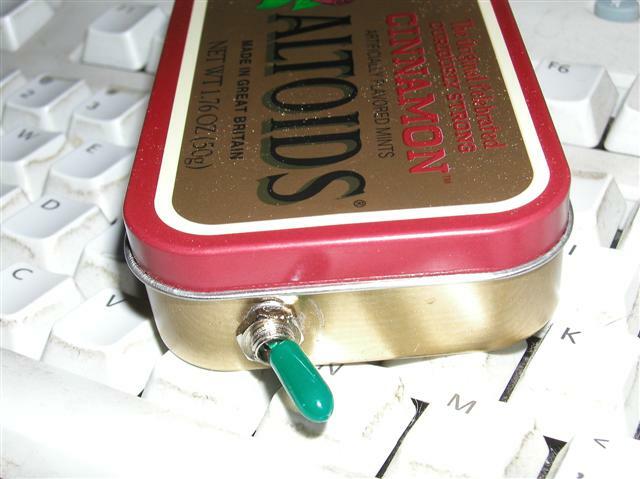 Thanks to a tip from Hack A Day, I spent a very enjoyable couple of hours making myself a little Altoids tin charger…USB version. It provides USB power for any device that will take such power (Palm, cell phone, etc. ), using a regular 9-volt battery that anyone can pick up anywhere. Handy for an emergency charge when you don’t have a handy USB port around. It uses an IC voltage regulator (an LM 7805 from Radio Shack, to bring the nine volts down to USB’s required 5 (more like 4.95). 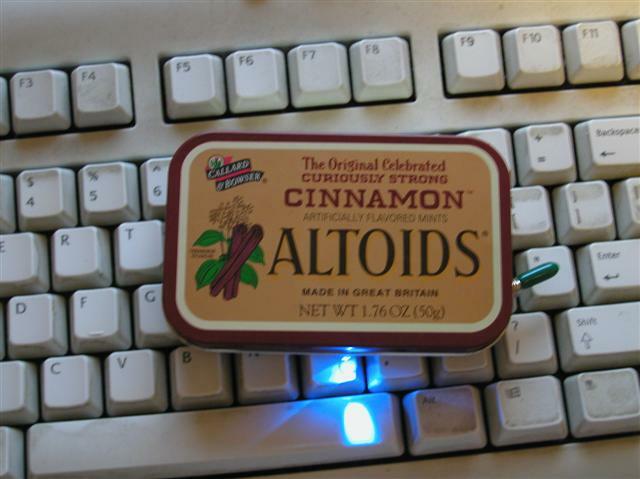 That extra few volts gets turned into heat, but the Altoids tin makes a very nice, usable heat sink–so no big problem there. Then, to make it extra-special-geekified, I added a little green on/off toggle switch, and (but of course!) a blue LED. Unfortunately, something I didn’t realize before I started, the Ipod gets charged through firewire, which is 12 volts–and won’t charge through a standard USB’s 5 volts. It’s weird, because (sometimes) when plugged into a USB port on a computer, the Ipod’s little indicator will say it’s charging…but it’s really not. So now I think I have to make another one, with two 9-volt batteries, and an LM 7812 instead of the 7805, and a firewire port instead of USB. That will require some different architecture…or a bigger tin! (Maybe band-aids). In any case, one thing I think I won’t do is take this with me on any airplane trips. No matter how cool I think it is, I’m not convinced that the average everyday TSA screener will agree with me. There are some adventures I think I’d rather avoid.